Des and Liz are familiar sight at festivals and shows across the world. Demonstrations of their craft have proved a popular attraction for visitors of all ages. From keyrings and bellropes, to knotted fenders, it is a fascinating sight to see a knotted object being created, often from start to finish. With their rope making machine Des and Liz are able to demonstrate the ancient art of making rope. 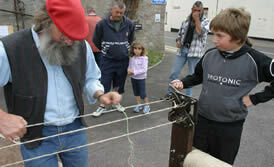 An interactive exercise, children and adults alike enjoy helping to create a piece of multi strand rope. Des and Liz Ropemaking outside the Royal Southern YC, Hamble in August 2012 as part of the club’s family day to celebrate its 175th anniversary. Bit of film courtesy of SashaMill Films, talking about ropemaking and a quick view of our 1682 ropemaking machine in action for the first time in we do not know how many years as well as using our normal demonstrating machine.